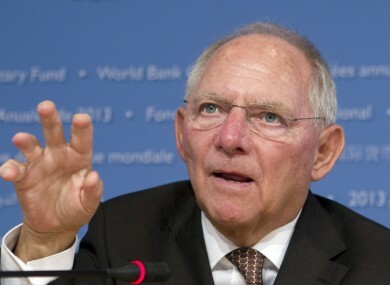 Wolfgang Schaeuble said that that retroactive use of the the ESM to recapitalise Irish banks was not probable. THE GERMAN FINANCE Minster Wolfgang Schaeuble said today that it is unlikely Ireland will be able to have “retroavtive” access to the European Stability Mechanism(ESM). Ireland did what it had to do and now it’s fine. He added that any “retroactive” bank recapitalisation is “especially not probable for the time being because there is no direct bank recapitalisation, it is not even in the given treaty, and in Germany we need a change of German legislation…”. The government has been pushing for the ESM fund to retroactively recapitaise the Irish banks that were recapitalised by the Irish taxpayer when the banks got into difficulty. Last month, the ESM Managing Director Klaus Regling played down the chances of Ireland securing retroactive direct recapitalisation of AIB and Bank of Ireland. Email “German Finance Minister: 'Ireland did what Ireland had to do. And now everything is fine'”. Feedback on “German Finance Minister: 'Ireland did what Ireland had to do. And now everything is fine'”.